A. Cancellation done before 48 hours of guest check-in: 75% of the total amount paid will be refunded. 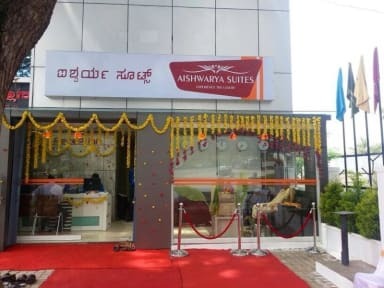 Aishwarya Suites is conveniently located in the vibrant and central Mysore district, overlooking the Royal Mysore Palace; and the major tourist attractions are only 15 minutes away from the hotel offering you an easy access throughout the city. A couple of minutes walk from the suburb bus stand and with an easy access to all the shopping and entertainment zones. -Superior rooms equipped with split A/C and Non A/C Standard rooms. -Full-size pillow-top bed draped with lavish quilts. -LCD television with major satellite channels. -Magnifying mirror and Hair Dryer. -Round the clock Room Service. -Running Hot & Cold Water. 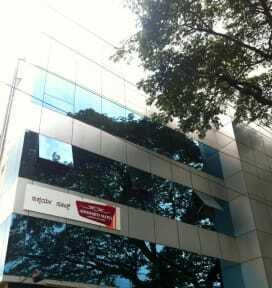 -Hot water kettle in all Air – conditioned rooms. -Travel Assistance and Sightseeing Booking. -International plug points in all rooms.